we are overwhelmed by the continuously increasing activity on our Consulting Q&A and are glad that you are using this forum to connect with each other and our experts. We always look for ways to improve our Q&A which is why recently, we introduced the option to include images in your questions and/or answers. We hope you like this new feature! To thank you for being the world's best case interview community, we are giving away a six-week premium membership for free! All you have to do is answer the following market sizing question. We will draw the winner on Wednesday at 10:00 (Central European Summer Time). Until then, best of luck and keep rocking the rest of your case prep! France is similar to the United States in demographics and fuel consumption. The population of Paris is 3 million. 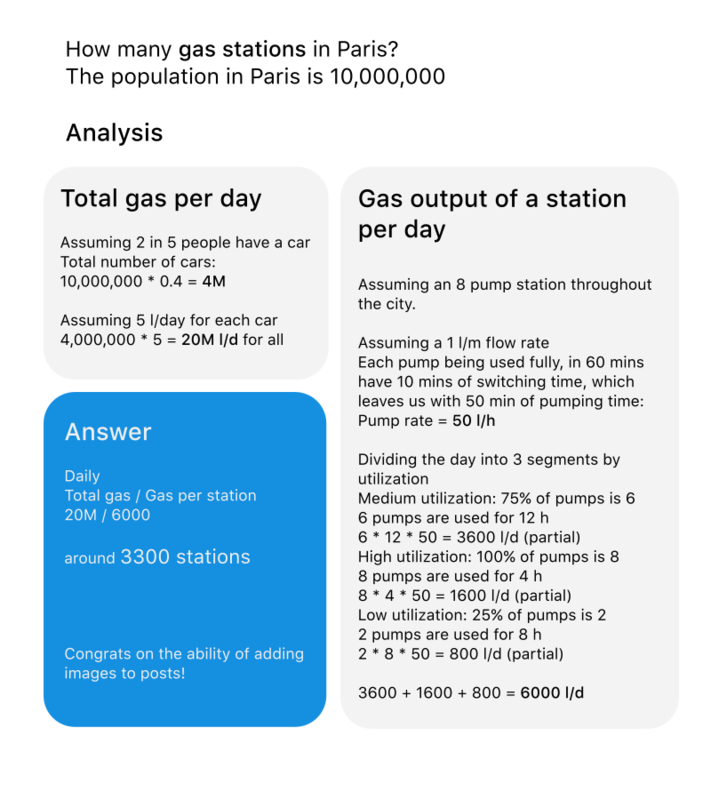 Then, I would estimate the number of people serviced by 1 gas station in my community (in the US), using this information I would calculate an estimate for the number of gas stations in Paris. I live on a major road in Hartford, CT that feeds into several smaller (mostly residential streets and closes. There are 4 gas stations along this stretch and the estimated population of the neighbouhood it services is 20,000. Consequently, 1 gas station services 5000 (20,000/4) people. Given the assumed similarity between France and the United States, The number of gas station in paris is 600 (3,000,000/5000). My answer is based on the following 2 facts. A 'gas station' is anything with >= 1 public gas supply pump. The analysis is for Paris Metro area. As for my answer - I believe there are 100 gas stations within the metro area. This is a demand problem as we can assume that if demand was not being met, there would be more gas stations opened. Therfore a car fills up every 3 weeks= ~ 50K cars per week use gas stations. Sorry for the late answer. Would be great if you guys could share some feedback on my approach. Considering the fact that France's oil consumption figures have reduced from 1.9million bbl/day in 2006 to 1.6million bbl/day, in 2017 owing partly to the advent of the affordable electric vehicles and pervasion of the same, let us consider 85% capacity in 2017 compared to that of 2006. Now, let the average filling station in Paris cater to both gasoline & diesel consumers. On an average underground fuel tanks at filling stations have a capacity of 30~40kilolitres. The capacity is so selected to cater to an average of 3-day demand at the filling stations. There should be separate tanks for gasoline & diesel. Let us consider one 30kilolitre tank with an average of 3 days capacity for diesel in a filling station. This gives us a daily consumption of 10kilolitres per filling station for diesel. Therefore, a maximum of (8.72million litres(diesel) / 10kilolitres = ) 872 filling stations are there in Paris. Similar calculation considering gasoline would give a figure of 471 filling stations. However, as diesel consumption is almost twice that of gasoline consumption, and owing to the fact that filling stations would prefer using similar capacity underground tanks owing to space constraints, economic & technical reasons, it seems that quite a few filling stations would be 'diesel only'. Hence, let us go with a figure of 872 for this case. You can also check out the full case study and solution to get all the details. It's time to draw the winner! Congratulations, Phan Thien Phuoc! You won! You will soon receive a message including your 6-week Premium Membership coupon! Great job to everyone and thank you all for participating in our first Consulting Q&A Quiz! Good luck for the rest of your case prep! Can you please define Paris?